Reigning in the use of flash from Big Sky's old website, buoy's more than SEO. When the "whiz bang" of Big Sky's old *all flash* website wore off, they quickly realized the need for a sustainable more robust website. With a new site already underway, Big Sky saw something in Sienna Creative Works' quick site analysis and vision. After some coaxing by the client, Sienna Creative finally agreed to take on their site overhaul. Eventually, this project led to Sienna Creative Works' being Big Sky's brand agency of record. Founded in 1994, Big Sky Landscaping is one of Oregon’s largest award winning landscape architecture firms. Big Sky hired Sienna Creative to overhaul the customer experience of its corporate website. 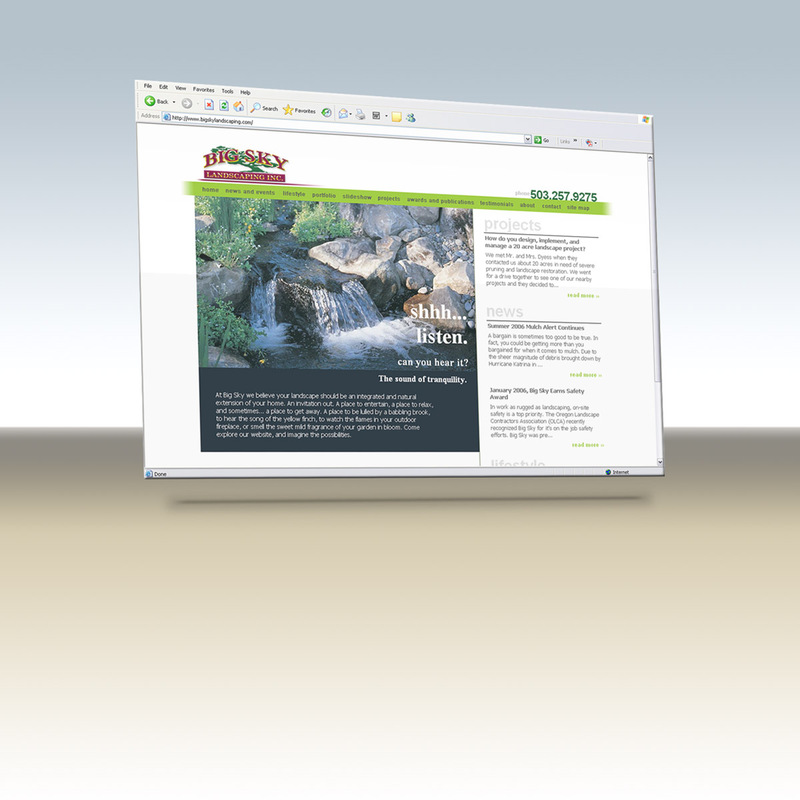 "Greg at Sienna Creative really opened our eyes on how we should view the mission of our website. We knew we were in good hands when he grasped our corporate vision right away, and almost immediately knew where he could take our company image." Homepage bounce rates dropped by more than 50%. Navigation was replaced with one common user interface that allowed for scalability and tripling of site content. Statistics show that users are getting to deeper content and exploring more project portfolios, and visiting more "company" oriented content more quickly from the homepage. Measurably improve the customer experience, improve navigation simplicity, and create a clean image focused site. This phase involved competitive SWOT analysis with review of industry and key competitor sites. It included Use Case analysis both internally and for target audience groups. Corporate brand review. As a first step in building the image context for the project, Sienna Creative reviewed Big Sky’s corporate collateral and current site at the time – to establish a baseline undercurrent for a corporate brand identity. Internal stakeholder analysis. Review existing project review and site management processes to be sure that our mioVOX CMS was fully optimized for their staff needs and use. Marketing and customer review. Sienna Creative reviewed over 70 client testimonials along with current collateral in use to help determine what was working and what was not. It was quickly obvious that their end product nearly always ended in glowing reviews. Performance and usage metrics. In order to set starting benchmarks Sienna Creative analyzed current site performance, usage metrics and other website usage data. Competitive Analysis. National review of best practices in use for their industry, as well as local key competitors. Establish core take-aways for their project/audience needs. Sienna Creative developed a simple high-level strategy to guide the rest of the redesign project, based on everything that had come before in the project: business analysis and expert review, stakeholder interviews, data analysis, competitive reviews. Sienna Creative created a "wireframe" to show, tactically, how the customer experience would navigate and flow. Then followed by 3 graphic design mock-ups based on this wireframe for corporate review and tweaking. Because a site is only as good as its photography, Sienna Creative provided imagery and art direction for Big Sky’s current photographic talent pool. This led to significant and competitively meaningful results for Big Sky and its website, but for all of its marketing efforts. Sienna Creative enhanced its mioVOX™ multi-client Content Management System to include specific features to further improve content creation and work flow for Big Sky staff. Sienna Creative also handled all site porting and email account setup, and final onsite CMS training for the Big Sky staff.